About 3 months ago, I received 6 ranchus from Cynthia of East Coast Ranchu (ECR). I had originally ordered 5, but Cynthia graciously added an extra. This one only had one eye, and I took an immediately liking to him, and have named him Bandit. 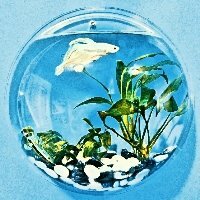 Bandit lives in the 100 gallon tank with his chu-crew, Thing 1- Thing 5, 2 ryukins (Boss Lisa, and Mr. No Name), as well as two others, The Stakos and UnaBuna. Today, I'd like to give you the update on Bandit and the Things, as well as Boss Lisa and Mr. No Name. The other two fish I will save until a later time, since I want to devote an entire thread to my coming back to single tails. So, without further ado, here are most of the crew in the 100g. They have grown lots in the almost 3 months they have been here, and I am very pleased with them. Currently, the 100g is a fine place for them, especially because I am doing 90% WCs every 4-5 days, but as they get older, I will place them either in my spare 55g, or make some other arrangements. For now, I am loving seeing these fish together, and growing up fast. This is their home. Thanks to Tammy's encouragement, I dove back to having plants, even if they are only anubias. Thing 1 & Thing 2 are black Thai ranchus. They were the tiniest creatures when they came, and are now getting there. I can tell the difference between them, but taking pics of them is not so easy. So, here are some representative pics. Boss Lisa. I wonder whom he's named after. I know this was quite a lot of pictures, and I thank you for your patience in going through them. Wow! They are stunning Bandit is so sweet! Oh my gosh! I am gorgeous in fish form! Your chus are adorable no matter how many eyes they have. . And Mr No Name is a handsome little guy! And what's wrong with Anubias? They got me into plants. We're not all Jess, Hidr, or Fang! Wow they all look great! love the black Ranchu! Bandit is awesome too ! Love love love all these fish! Referred By:Researching goldfish on line. Very fun! They are great. I love the Boss. The tank, with all it's new plants, looks great. Go buy more. I really love anubias, and I'm still not finished collecting them. Glad I could inspire you to try plants again. Never give up! Yolo! All of your fish look beautiful; I'm still jealous of your seemingly effortless photography. First off - nice phortos of a beautiful aquarium. I'm partial to calico goldfish and fantails so I love Mr. No Name, but they are all very nice fish. Very nice group of fish you have there. I want that black and white ryukin!! As always, your fish are awesome! But I'm wowed that you have FIVE LIVE PLANTS!! Way to go, Alex!! They aren't so hard, you know -- you don't have to water them. I am super jealous of your gorgeous fish and gorgeous pictures! Lovely set up and some great looking goldfish. The boyfriend and I both thing 'Bandit and the Things' would make a great band name. Bandit is quite awesome, and I very much appreciate Cynthia of East Coast Ranchu's thoughtful gesture! I think Waddles would look great next to Boss Lisa in my tank. I'll just shuffle some out to a different tank when you send him to me! Thank you, Nicole! We are due for an update from you, I think! Thank you! They are so much fun to watch, and feed! Thank you very much, G! Shall we all have a chu off? My photography is not effortless. I just spend about 15 minutes taking random shots, and see what comes out well. I love anubias, too, and will be getting more. Thank you, Shelly! I was joking about the anubias. I love those plants. Don't let it get to his head! I actually think Mr. No Name is actually a ryukin. He was sold as one. Moreover, I have to confess that I took these pics perhaps more than 2 weeks ago. I took some more pics last night of him, and the hump is already a little more pronounced. I'll add those pics to the thread in a little bit. Nevertheless, fantail or ryukin, I really like him! I am actually quite fond of plants. I just needed for the lighting to be better, and now that it's somewhat improved, the plants are coming back! Ha! I am super jealous of YOUR fish and tanks! Note: I had to remove some emoticons, both from my responses and from the quotes, because I had exceeded the limits allowed per post.